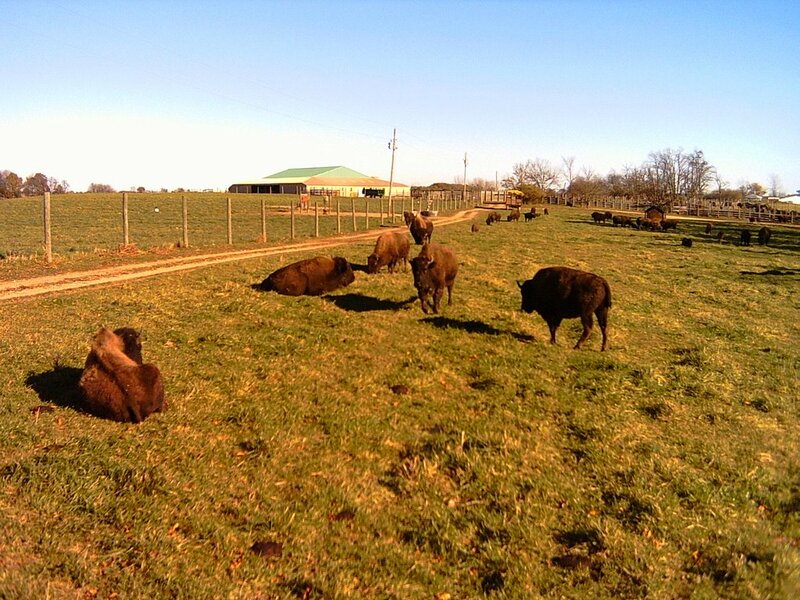 Sunday was such a beautiful day, we decided to go for a ride up to a buffalo preserve. First stop when we arrived was at the store. All kinds of wonderful things were there for purchase, along with buffalo hides, bones, and meat. 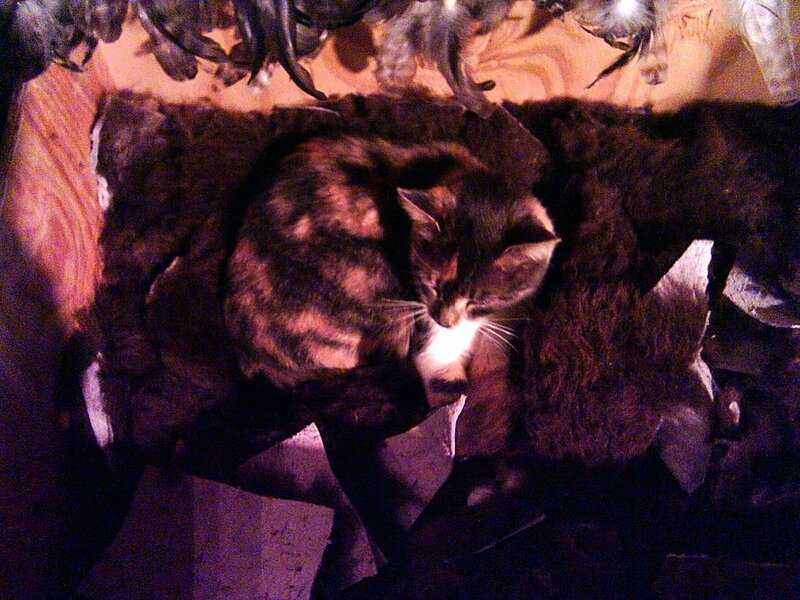 As I walked through the store, I looked down in a box with pieces of buffalo hide, and saw something move. This llittle cat had made a comfortable bed for herself, and blended right in. This is one of two of the Father bulls. 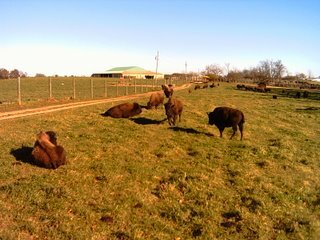 We were driven right into the pasture where the herd was. The guide informed us that by being in the back of the truck, we were part of the herd. They didn't pay too much attention to us as we admired them. This was a herd of 200, but 40 were just pulled out to thin the herd, as the land can only support about 160. Some are sold to other preserves for new genitic material, and some will be processed for food. The herd was a little spread out on this day as the roundup was done the day before we came, and the herd was a little disorganized as they were processing the changes. 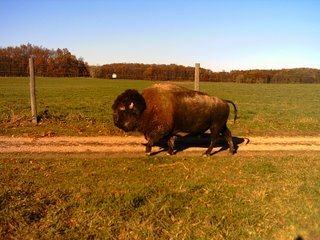 Buffalo are a matriarchial society and there is one elder head of the heard, usually one that has had many children and grandchildren. When she is gone, another head of the heard is chosen by the buffalo. None of the female buffalo leave the preserve. This is the alter where the remains are honored. 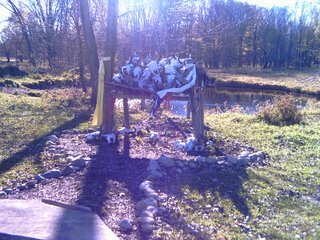 The ribbons are prayer ribbons left by visiting Native Americans. The buffalo know these are their elders, and often will stop by and pay their respects. One could not go away from this place without the feeling of a Sacredness and a sense of awe at these magnificent creatures. Cool beans... We don't have buffalo in our parts. I didn't think we had any close to here either, but there it was. It's been there for years and I never knew about this place. You may be surprised to find some closer to you than you think.